Short harvesting windows necessitate productive harvesting technology. 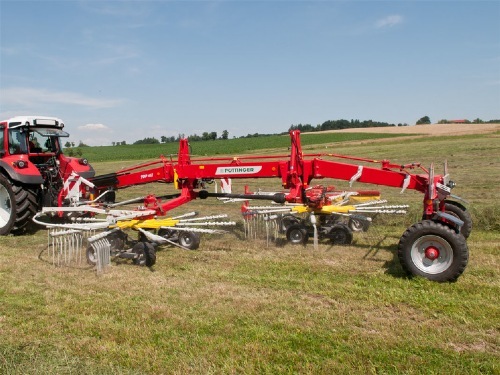 With the professional TOP C s-line series, we offer powerful centre-swath rakes with the highest possible harvesting performance. Tine arms per rotor 13 pcs. Removable tine carrier arms per rotor 13 pcs. Tines per tine arm 4 pcs. 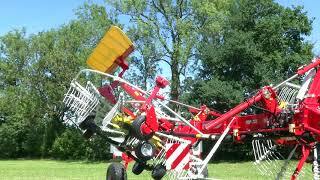 Avoiding a backlog during harvesting demands highperformance agricultural technology. 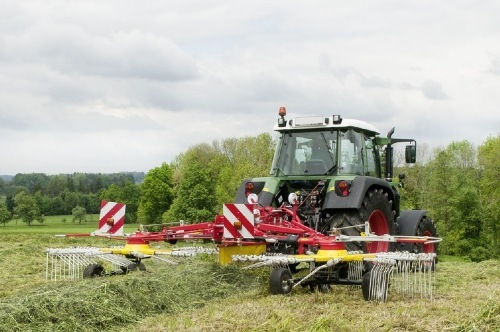 The performance of silage trailers and self-loading wagons can be increased by up to 20% if the swath is of optimal shape and uniform density. 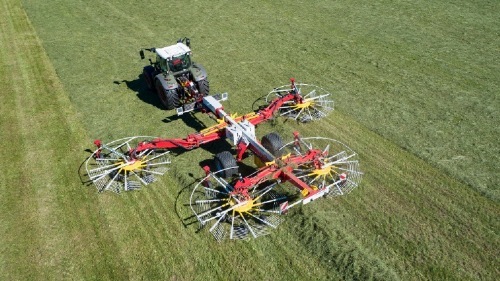 PÖTTINGER has developed a unique hybrid drive technology: four-rotor rake. Hydraulic drive at the front, mechanical drive at the rear. The working width can easily be adjusted from 8.0 to 12.50 m.
Raking around obstructions is no problem. 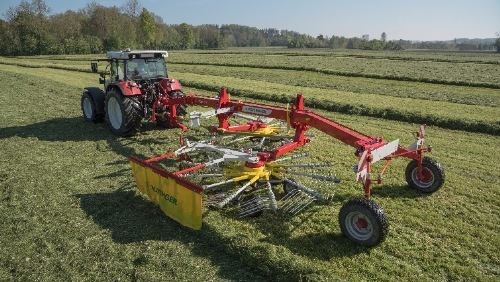 The raking width can even be adjusted while working thanks to the pivot wheels. 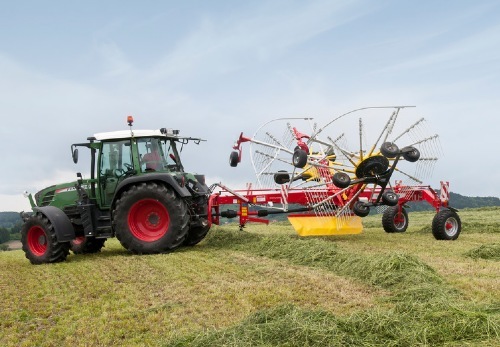 This impressive and proven rotor technology from PÖTTINGER is now also integrated in the four rotor rake. The whole tine arm can be exchanged quickly and easily in the event of any damage. Just undo two bolts to slide the tine arm plus cam roller out of the rotor casing. 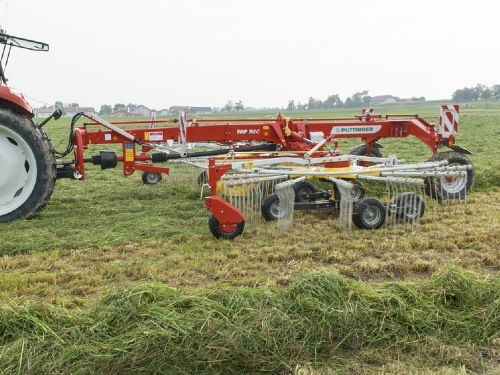 The hydraulic drive of the front rotors enables the extending arms to be pivoted inwards for a transport height of only 3.99 m without removing tine arms or folding safety guards. Annoying setup times are therefore a thing of the past. Large dimensioned 500/50-17 tyres minimise pressure on the ground in the field while maximising driving comfort on the road. Optionally available are 620/40 R 22,5 or 710/35 R 22,5 tyres. Choose between pneumatic or hydraulic brakes. Mechanical interlock and support for safe road transport. 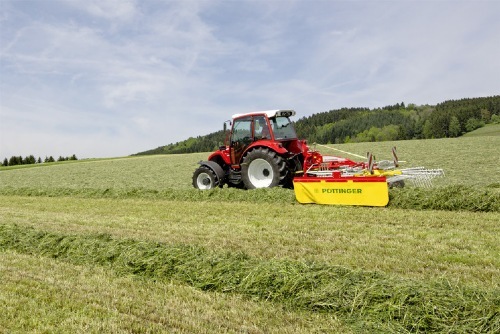 PÖTTINGER ground hugging technology meets the very highest expectations. There is no better solution. The result is tidy raking work at the same time as protecting. The tandem axles are fitted with large 16 x 6.5-8 pivoting wheels. Pentagonal chassis (5 wheels) for inside the sweep of the tines are standard. 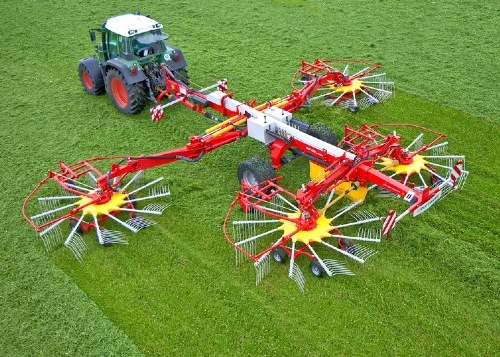 The MULTITAST ground hugging wheels with anti-wrap guards can be fitted as an option and – together with the floating rotor suspension – guarantee precision guidance of the tines over undulations. Because the tandem axles are adjustable, the angle of the rotors can be adjusted precisely to the operating conditions in just a few minutes. One double-acting remote is for lifting the rotors and two doubleacting remotes are used to adjust the working width. 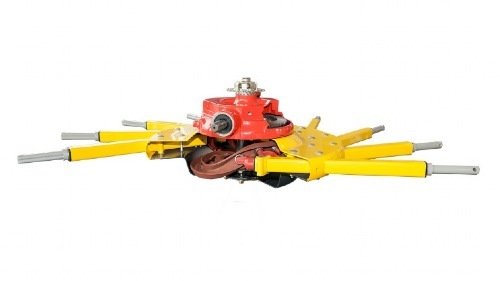 An especially convenient electronic POWER CONTROL terminal is available as an option for lifting the rotors individually and adjusting the rotor height hydraulically. Also an especially convenient electronic terminal is the CCI ISOBUS terminal with all functions of POWER CONTROL and more.